When first revealed at CES last year, Samsung boasted that its Portable SSD T1, which put a full terabyte of speedy flash-based storage inside a credit card-sized housing, could eventually see capacities of up to 16GB in a few years. That’s not too hard to believe, because exactly one year later, it’s already grown to 2TB. Called the Portable SSD T3 (because apparently there were issues with the Chinese translation of T2) at 51 grams the second version of the compact external SSD drive weighs about twice as much as the original did. But that’s due to a new shock-resistant metal case and internal frame—not the bump in storage capacity. Transfer speeds are spec’d at up to 450MB/sec, and the drive supports USB Type-C now, although with a proper adapter cable you can still connect it to devices lacking that newer port. Including Android mobile devices that support external drives through the use of a forthcoming app. So you can carry a healthy stock of 4K movies in your pocket, without maxing out your smartphone’s limited storage. 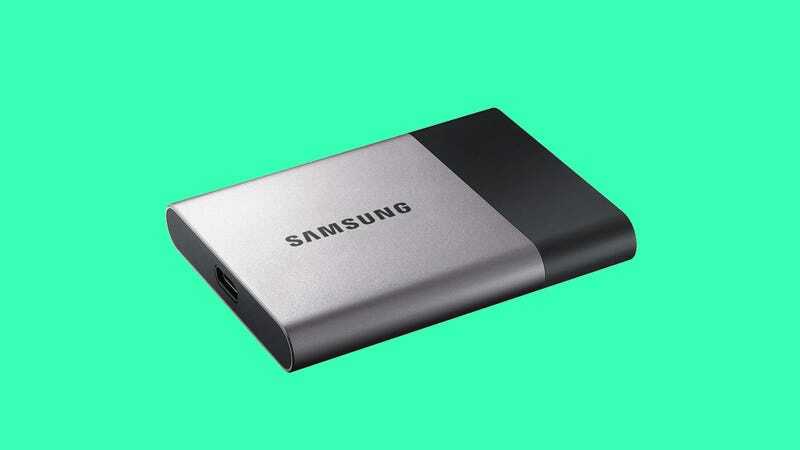 Available starting in February, Samsung hasn’t released pricing details for the Portable SSD T3 yet. But the original 1TB version still sells for around $380. So you can expect the upgraded model, which will be available in 250GB, 500GB, 1TB, and 2TB models to be even more expensive at the top end.